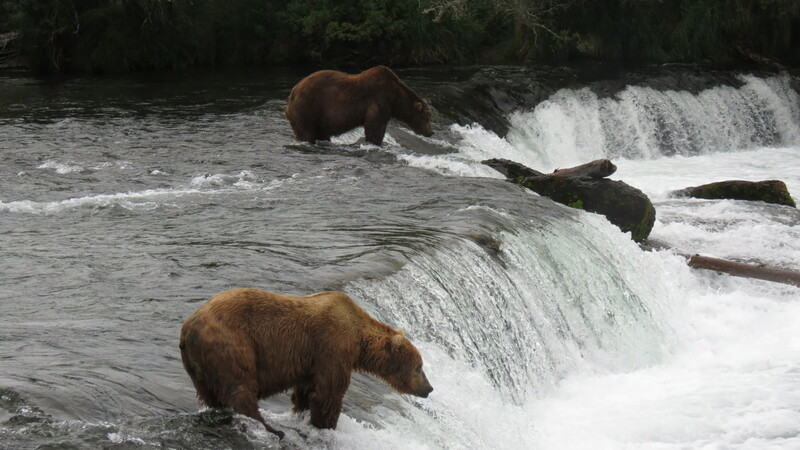 Katmai National Park is for bear viewing and the valley of the 10,000 smokes. 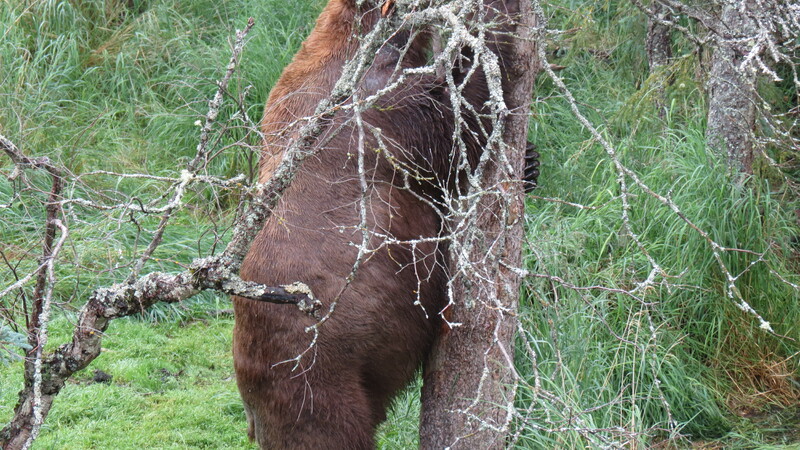 I didn’t see the latter, but I did get to the former, and the bear viewing was spectacular. 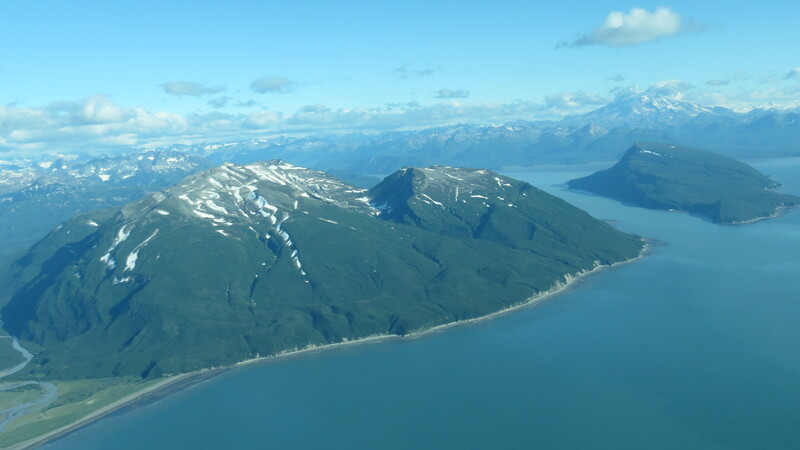 Located about 220 nm SW of Anchorage, it is reached by float plane, with about an hour and a half ride over rather spectacular scenery. One arrives at Brooks Lake, and gets off the float plane on the floats. There is a short walk to the visitor center, where the ranger talks, and there is a good 10 minute video on dealing with bears. 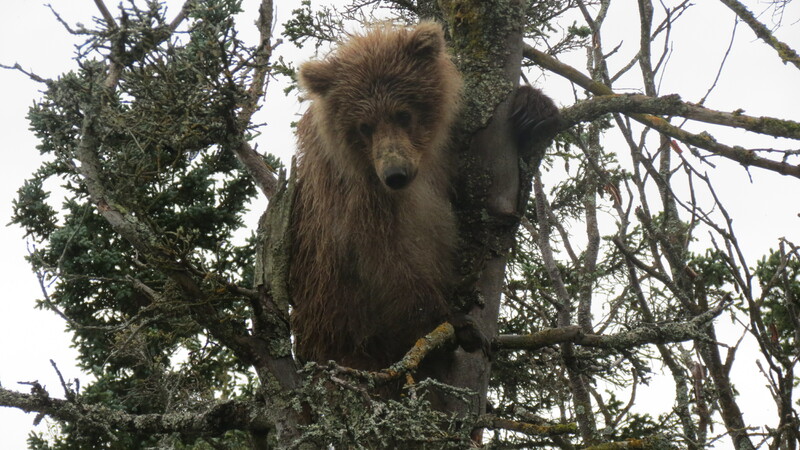 These are not the same behaved bears as in the Brooks Range, who have likely never encountered people. These bears are near people, but so long as people stay on walkways, there shouldn’t be much of a problem. The bridge over the Brooks River can be closed if there are bears in the vicinity, however, and bears are unpredictable. The area for viewing has a lower and an upper platform. 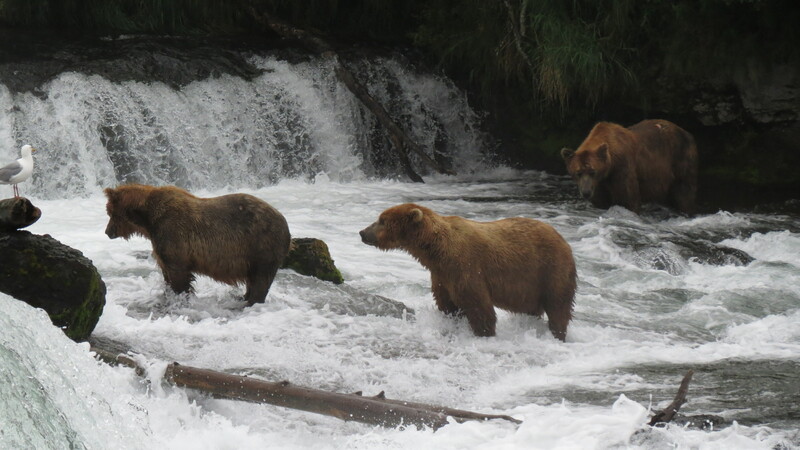 The downriver or lower platform is open without waiting, and the smaller bears tend to congregate there. The upper platform has room for 40, and one may stay no longer than an hour. However, after one leaves, they may immediately put their name on the list to go back. I did just that and spent an enjoyable 45 minutes at the lower platform seeing one bear sleeping in mud and another carrying his prize catch back into the woods. 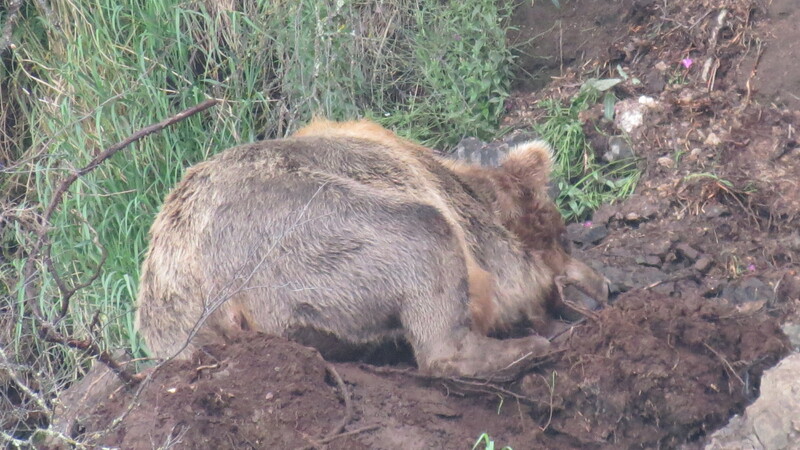 Brown bear sleeping in mud. The upper platform has a great view of the falls and bears will walk under the platform. Some of the bears at the upper falls viewing area. 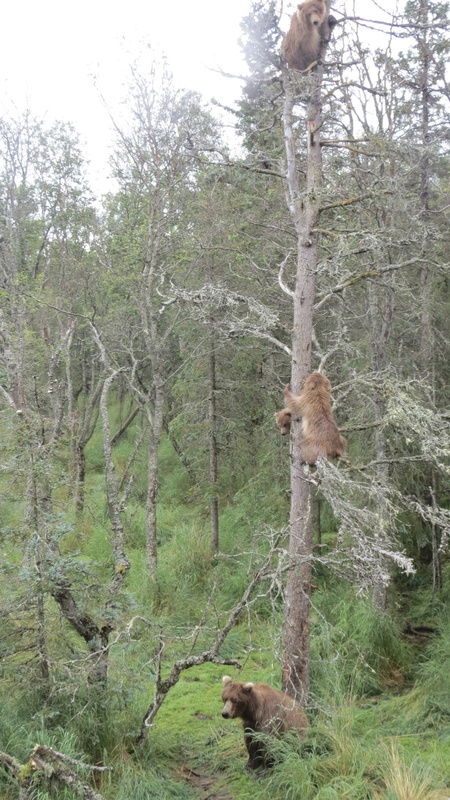 The highlight was a cub chased up a tree by a big boar, who barely missed him. 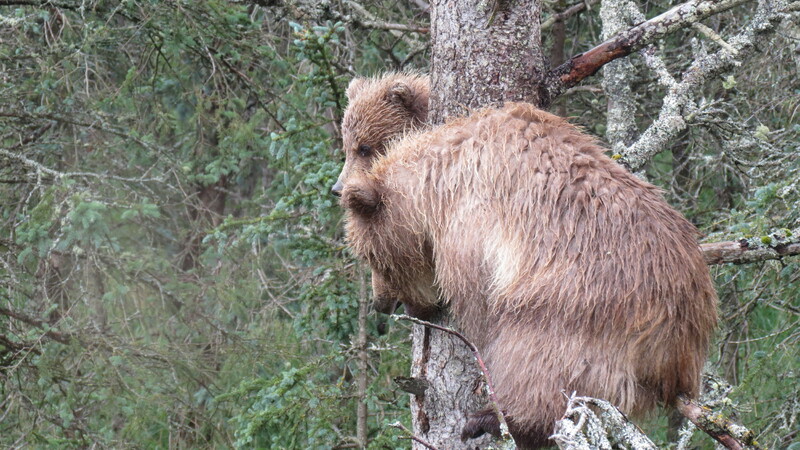 Young bears until 3-4 years of age can climb, but older bears fuse joints necessary to climb and no longer can. 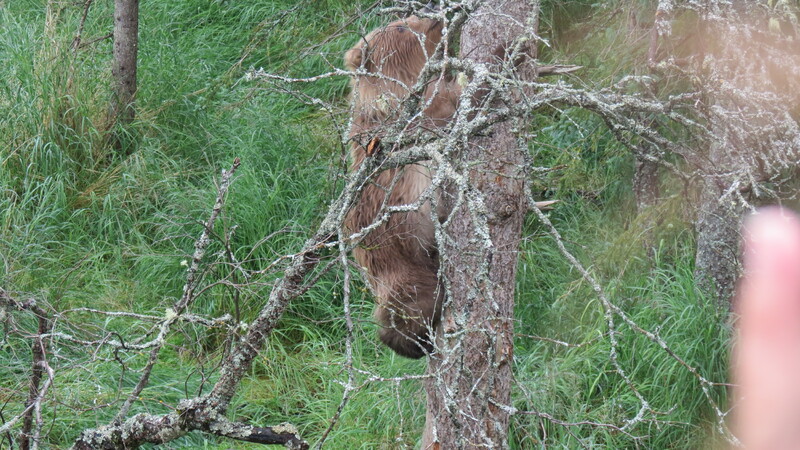 After awhile, the boar left and the sow returned with 2 siblings, sending them up the tree as well. 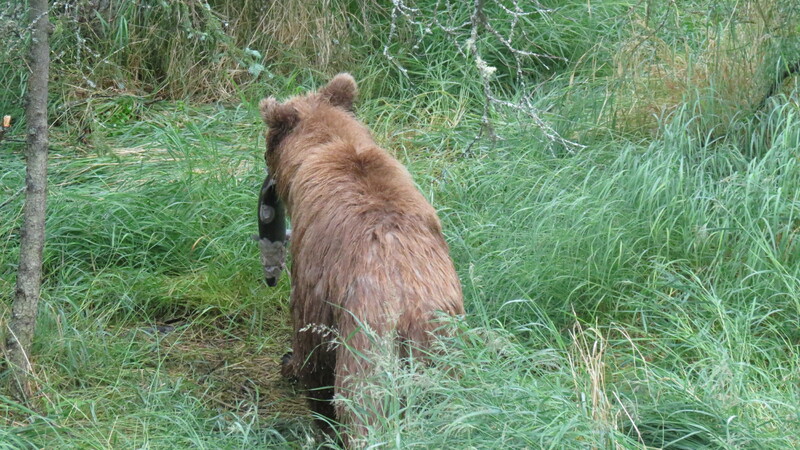 The three cubs did come down from the tree, Mom got them a salmon from upriver, and they disappeared into the woods. It is difficult to know how many will survive. There is a lot of food, but there is also a lot of predation. The spring cubs got a much later start, and it will be less easy for them. We don’t know the effect of human visitation has on the bears. Hopefully, it is not significant. The day was spectacular, and this is a park I definitely want to see again. 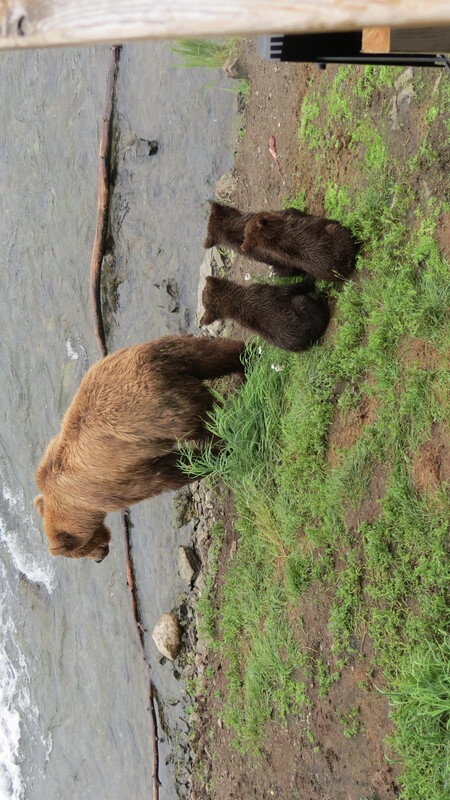 This entry was posted on July 26, 2013 at 11:18 and is filed under ALASKA TRIPS, KATMAI NP, MY WRITING, National Park Odyssey, UNPUBLISHED OUTDOOR WRITING. You can follow any responses to this entry through the RSS 2.0 feed. You can leave a response, or trackback from your own site.